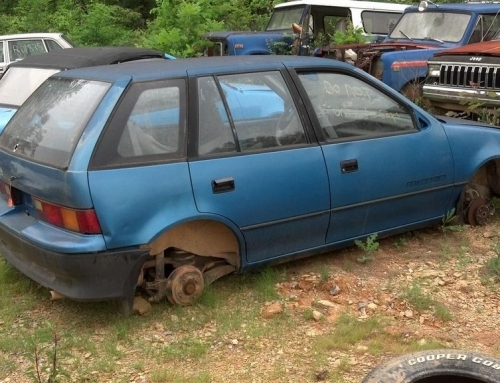 After a few weeks of searching we found a non-running SVT Contour “parts car” listed on craigslist for $400… and it was only about a 4 hour drive from us! We convinced our female companions what a great deal this was and started hooking up the trailer. In exchange for bringing another junk heap into our yard, we had to also agree to take the ladies along for the trip and visit IKEA (about an hour from where we were picking up the car). An SVT Contour for $400? Too good to be true? You’re right… It was. I’ll spare you the long boring details of piecing together the car’s history, but this is essentially what the car has been through. James had come to possess the car from his brother, who had bought the thing from another previous owner who we’ll call Paul Walker. Paul liked NOS, underglows, tribal stickers, and attempting engine swaps. The NOS obviously blew up the first motor. Paul tried swapping the motor and was in way over his head, so it sat in his yard for some considerable amount of time, not running. This is period of time is when tree fell on the car. The car got sold to James’ brother, all the Autozone ‘go fast’ parts were removed, and a few body panels were sold. This brings us up to date to the present state of the vehicle… Myself and Aaron were standing with James looking at this Contour with a nice tree shaped ‘dent’ in it, a motor that has clearly never run in the car, missing sparkplugs, missing hood, wires from missing lights hanging out of every panel, NOS lines still draped through the cabin, and a few boxes of random parts still unattached from the botched engine swap. So what did we do? We promptly make an offer and start loading it up, of course! James grabs his trusty Bronco II and a rope and pulls it out of the field for us. The Three of us started pushing it up onto the trailer and quickly decided the come-along was the better option. We paid James the agreed upon $350 and headed on our way to IKEA, where we were forced to spend two times more on cheap furniture than we had buying the Contour! On the bright side, the Contour made a great place to store our newly bought IKEA goodies.